Visit Cookie Surprises online at CookieSurprises.com which is one of the most unique and affordable gift options on the Web today. With over 80 hand-decorated Cookie Gifts starting at under $5, Cookie Surprises are sure to make a great gift or surprise for a friend or loved one. CookieSurprises.com offers unique hand-decorated themed Cookie Invitations and Announcements for all sorts of occasions. 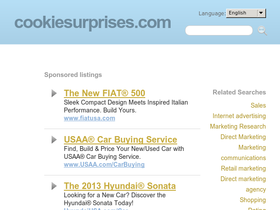 Check 58Coupons.com often for the latest Cookie Surprises discounts, Cookie Surprises promotions, Cookie Surprises sales and Cookie Surprises coupons for CookieSurprises.com. Place an order of $5 or more with Cookie Surprises and you'll get a free secret surprise when you enter this code at checkout. Send that special someone an animal cookie from Cookie Surprises.com and you'll receive a jungle surprise for free when you use this code. Order any Baby Cookie from Cookie Surprises and get a free surprise with your order using this coupon code. Click link and start shopping. Send that special couple a wedding Cookie and rose petals & ribbon will be included. Follow this link and visit Cookie Surprises today! Use this code to receive festive packaging at no extra charge with every Pink or Red Hat cookie order from CookieSurprises.com. Receive a free Karate Surprise toy when you order any Karate cookie from Cookie Surprises. Click link and shop!